But are super-injunctions a good thing? What kind of student movement do we need? Thatcher's health service dream realised? "This is a protest they will never understand" said one youth, as he, along with around 2,000 other young people, camped out in Puerta del Sol square in Madrid, defying a ban on demonstrations in the days before municipal and regional elections on Sunday 22 May. Bourgeois democracy in Spain is less brittle than the Mubarak dictatorship in Egypt, and can "deal with" movements such as these youth demonstrations even if it can’t understand them. But the inspiration from Tahrir Square is obvious. 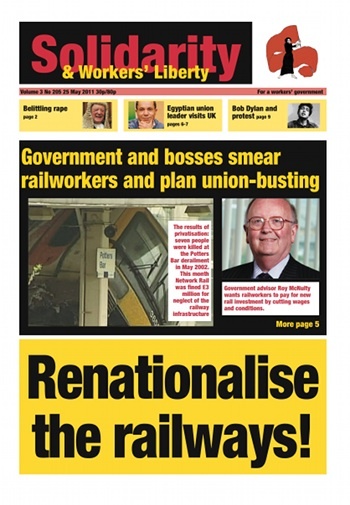 Tube drivers could now strike alongside other public sector workers on 30 June as part of the ongoing dispute to win the reinstatement of victimised union activist Arywn Thomas. RMT members working for Heathrow Express will begin a 48-hour strike on Friday 28 May as they seek an improved pay offer from management. Union leader Bob Crow has described the company’s current pay deal as “loaded with strings” In its current form it would effectively punish workers for being sick or missing work for other legitimate reasons. Although it offers a pay increase, this is contingent on workers meeting attendance criteria. Max Watson, chair of London Metropolitan University Unison, told Solidarity about the union’s campaign against course closures. Our ballot for industrial action starts tomorrow, 25 May, and closes on 10 June. We’re calling for a yes both for strike action, and for action short of a strike, so we can impose a work-to-rule. We don’t believe this fight will be won through one day of strike action; it will take a long campaign. We have an organising strategy which involves mobilising and involving all our members in the action, as well as recruiting new ones. This year’s CWU Conference comes as the pressure in both the postal and telecoms sectors is set to increase. In the Postal sector the threats from Royal Mail to close more mail centres has been met by postive ballots for strike action in the areas affected. The key question is whether those members affected will be left to fight alone or whether the Union will call a national ballot. PCS conference has agreed that members will be balloted over jobs, pensions, redundancy payouts and pay. This ballot begins immediately, the union hoping that if members vote yes, then it will take joint strike action with the NUT on 30 June. The bulk of delegates at conference agreed that the ballot should begin straightaway even though in many areas this will mean mobilising members from a standing start but the prospect of co-coordinating action with NUT is too important to miss. Readers respond to Pat Murphy’s article Why super-injunctions are good (Solidarity 3-204). Like Pat, I have no love of the tabloid press, and I have no doubt that they oppose super-injunctions for reasons of making money rather than free enquiry; but just because the Sun opposes something, it doesn’t make it right. Stuart Jordan responds to North London Solidarity Federation (SolFed) in our continuing debate on the differences and similarities between Marxist and anarchist traditions. In some areas, notably Nottingham, union activists are preparing for the probable strike against pension cuts on 30 June in one way. They are organising a joint strike committee of the unions likely to take part — NUT (teachers), ATL (teachers), PCS (civil service), and UCU (lecturers). They are inviting representatives of other unions whose members face the public-sector pension cuts, and job cuts, like Unison, GMB, and Unite, and people from anti-cuts campaigns, to come along too.